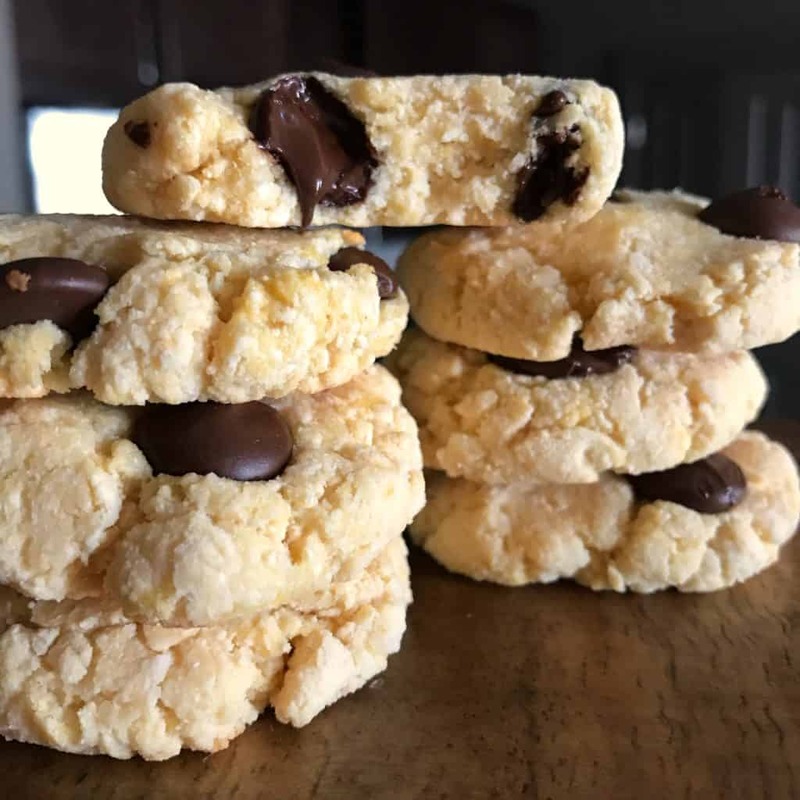 With 8 grams of protein, 12 grams of carbs, and 7 grams of fat, these chocolate chip protein cookies are one of most nutritionally balanced protein cookies you’ll come across. 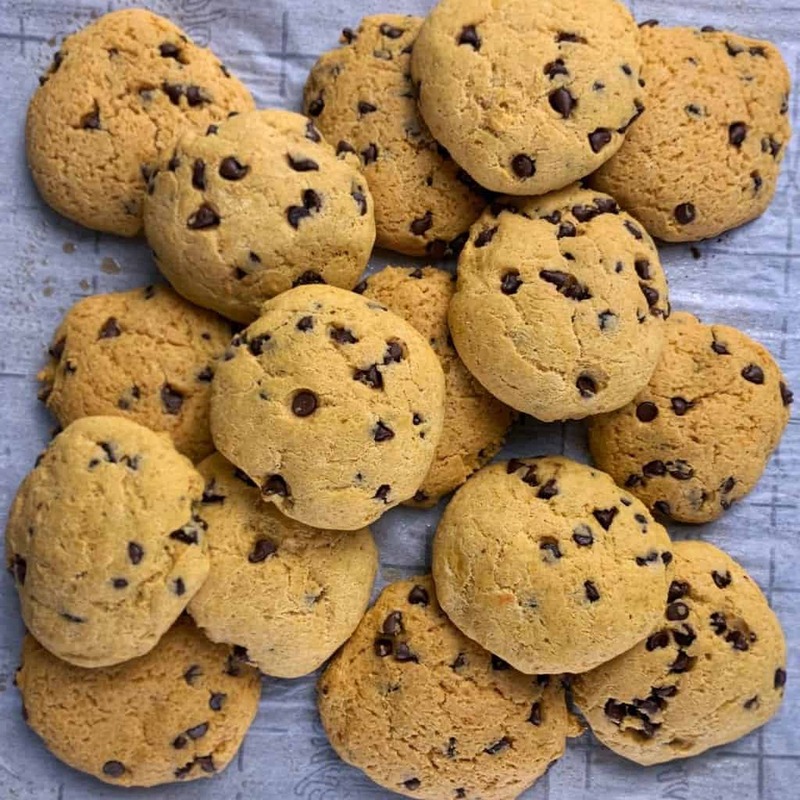 If you’re unfamiliar with the landscape, most protein cookies contain 20-plus grams of fat and over 200 calories per cookie. With those macros, I think I’d rather eat real cookies, ya know? Speaking of real cookies, that’s what I feel I’ve achieved with this recipe. What started out as Butterfinger protein cookies evolved into the peanut butter chocolate chip cookies you’re looking at here. After testing six different batches, these came out on top. But have no fear, I’ll keep working on the Butterfinger cookies. Like nearly every recipe on my blog, these protein cookies are super easy to make. They’re as easy as mixing a handful of ingredients together, forming a few cookies from the dough, and baking. I’ll cover ingredient modifications and replacement ideas in the ingredient notes section below. 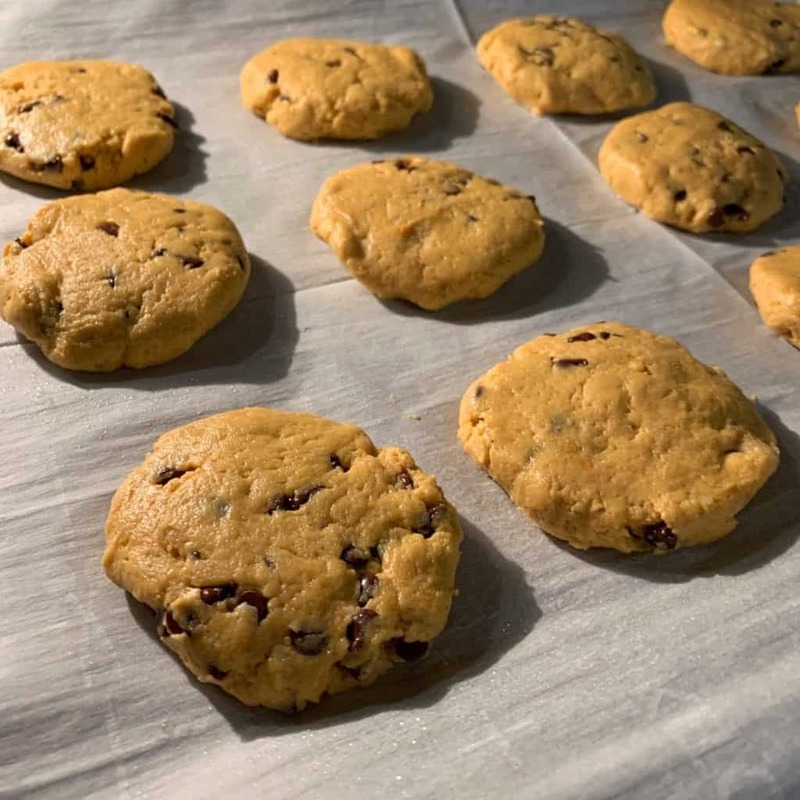 To hydrate the protein cookie dough, the recipe calls for a mix of light butter and canned pumpkin. If you’re not a fan of pumpkin, don’t worry, it’s a tiny amount you’ll never know is there. And I’ll leave a note on going all butter in the notes section. Once you mix everything together and form your protein cookie dough, it’s as easy as splitting up the dough and forming cookies before baking. You can almost see in the image below that I formed 12 smaller cookies instead of 8 like the recipe calls for. You can go either route, and I’ll include macros for a batch of 12 in the notes section. Easy enough, right? 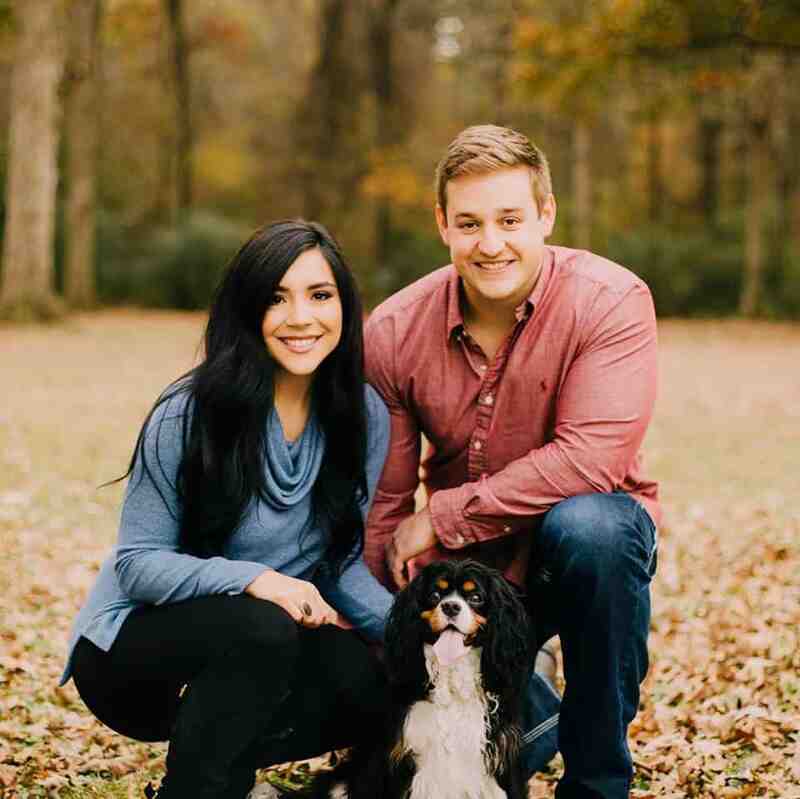 If you’d like to see them in action, watch the video below. If you’re on desktop it should already be playing in your sidebar. Let’s run through a few potential questions about ingredient swaps. I used PEScience Whey and Casein Protein Blend for these peanut butter chocolate chip protein cookies. If you’re familiar with my recipes, you know I typically use Dymatize 100% Whey. I highly recommend both of these products and like to say I’m not affiliated with either company, I just love the products. That said, feel free to use any protein powder you’d like. Though different types of protein may cook a bit differently. 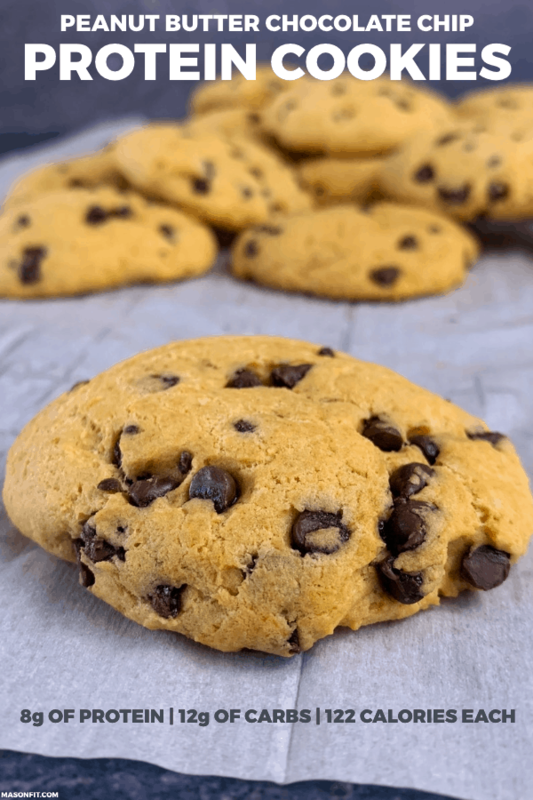 If you’re using a plant-based protein powder, for example, you may need to add a bit more butter or pumpkin to hydrate the protein cookie dough. The recipe only calls for a fourth cup but if you need a non-wheat alternative, you could try using 1-2 tablespoons of coconut flour. Start with one and add as needed since coconut flour is so absorbent. Since I mentioned the Butterfinger trials above, I can say that using 3 tablespoons of sugar free butterscotch pudding mix in place of powdered peanut butter works fine. You could also use real peanut butter and omit some of the butter or pumpkin. I’ve used sugar free pudding mix in other protein cookie recipes like my coconut cheesecake chocolate chip protein cookies. I can also say from the Butterfinger trials that a sweetener isn’t needed with 2 tablespoons of pudding mix and 1 tablespoon of powdered peanut butter. If you’re using another sweetener like stevia, you may want to start with 1 tablespoon and taste the dough to make sure it’s not too sweet. My usual recommendation for butter and pumpkin is to swap gram for gram but if you add an extra 60 grams of butter, you may throw the macros way off. Remember, we don’t wanna be like other protein cookies out there. So if you don’t like pumpkin, try using 3 tablespoons or 45 grams of unsweetened apple sauce. Or a bit more butter and a splash of unsweetened almond milk to hydrate the dough. But I promise, you won’t know the pumpkin is there. 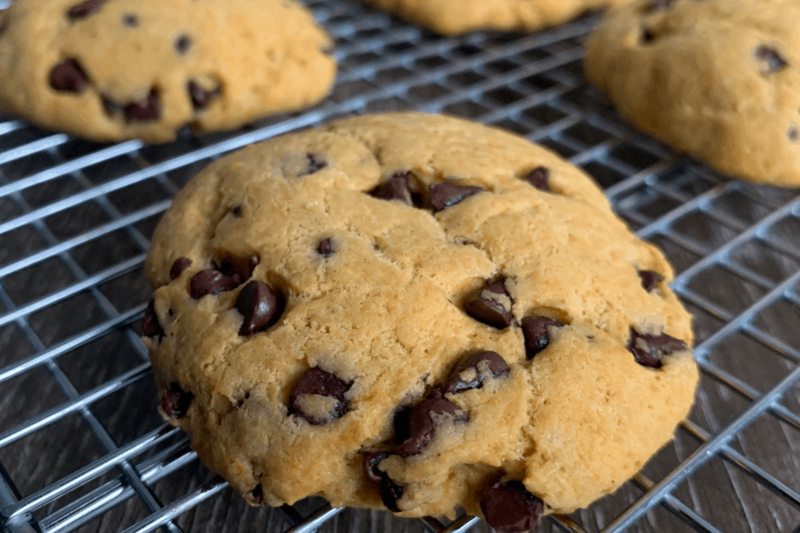 If you make these chocolate chip protein cookies, I wanna see them. Take a pic and tag me on Instagram @mason_woodruff. 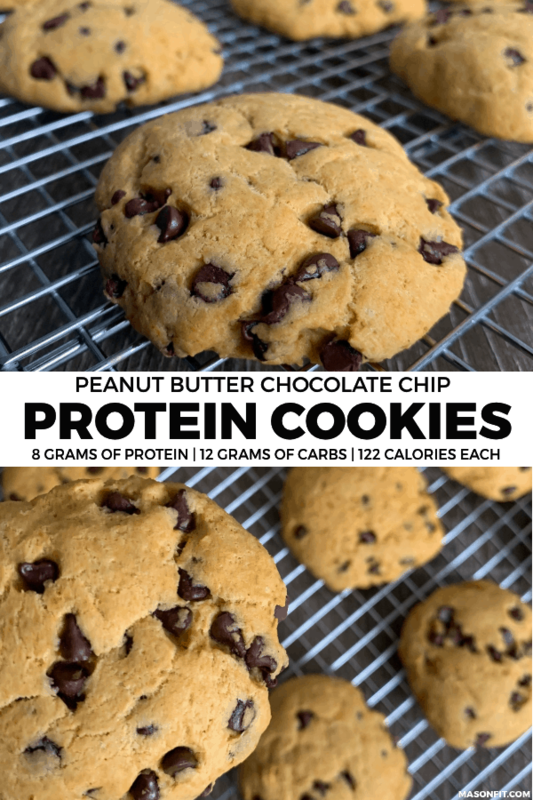 Quick and easy protein cookies with 8 grams of protein and 12 grams of carbs per cookie. Preheat oven to 325F and line a baking sheet with parchment paper or nonstick cooking spray. 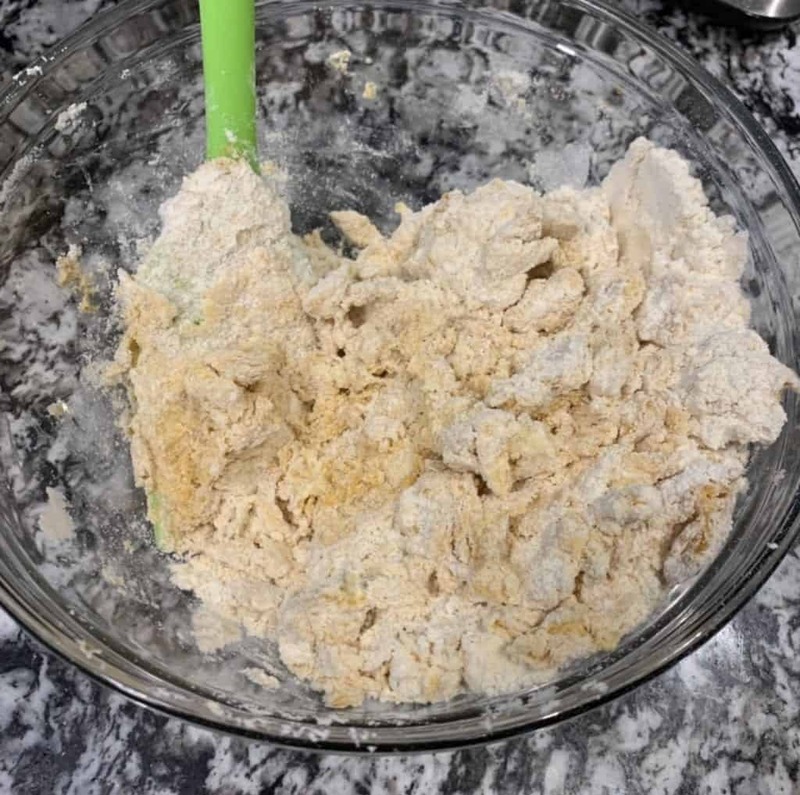 Add the pumpkin and continue to press the dough flat and fold remaining dry ingredients into the moist areas of the dough. 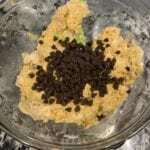 Once the dough is evenly mixed, fold the mini chocolate chips into the dough. Separate the dough into 8 pieces and press each piece flat between your palms before placing on the baking sheet. 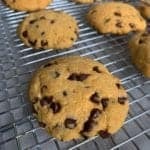 (You can make however many cookies you'd like for different calorie counts.) Spray your hands with a bit of cooking spray if your cookie dough is sticky. Bake for 12-14 minutes. Remove to cool and store leftovers in an airtight container at room temp. If you're modifying the dry ingredients in any way, be sure to add the butter in first and add pumpkin as needed. If you're using a whey with a finer texture, you may not need as much pumpkin. 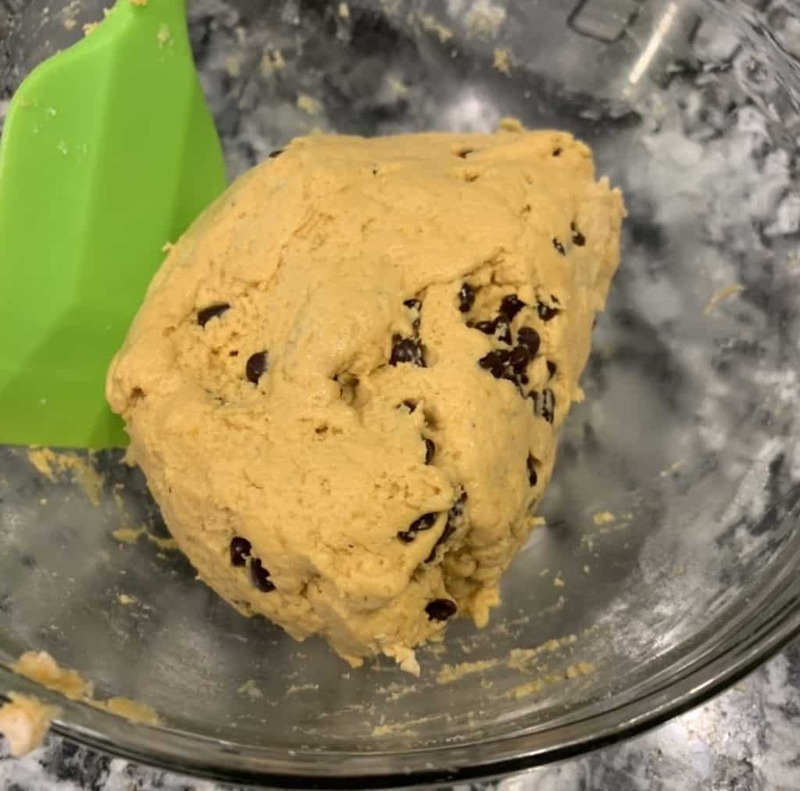 Check out my modified recipe for single serving protein cookie dough if you'd like to boost the protein and have a 227-calorie portion of just cookie dough. 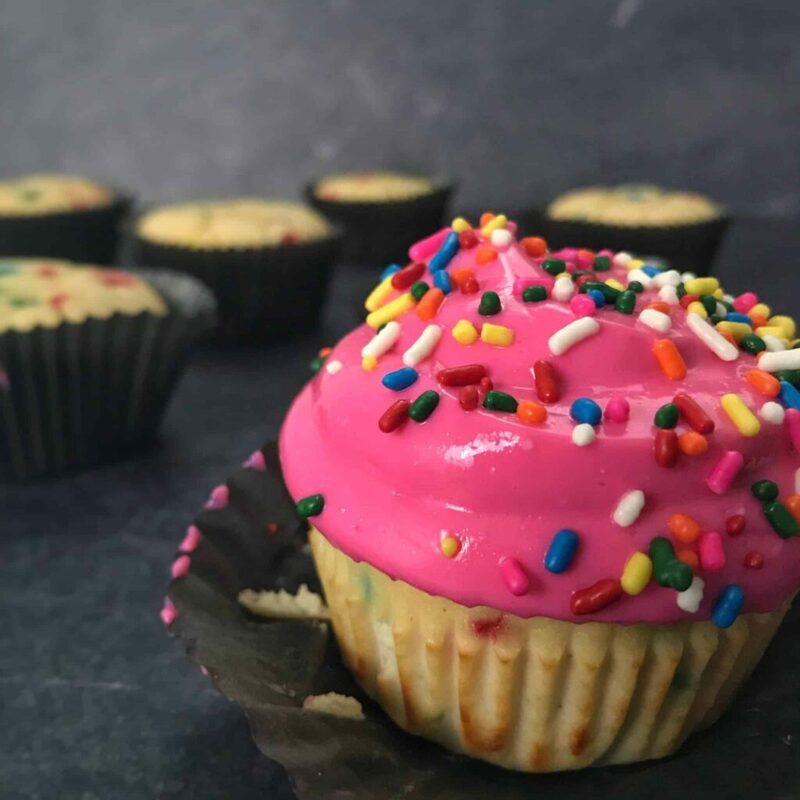 My birthday cake protein cupcakes are another easy recipe perfect for get togethers. 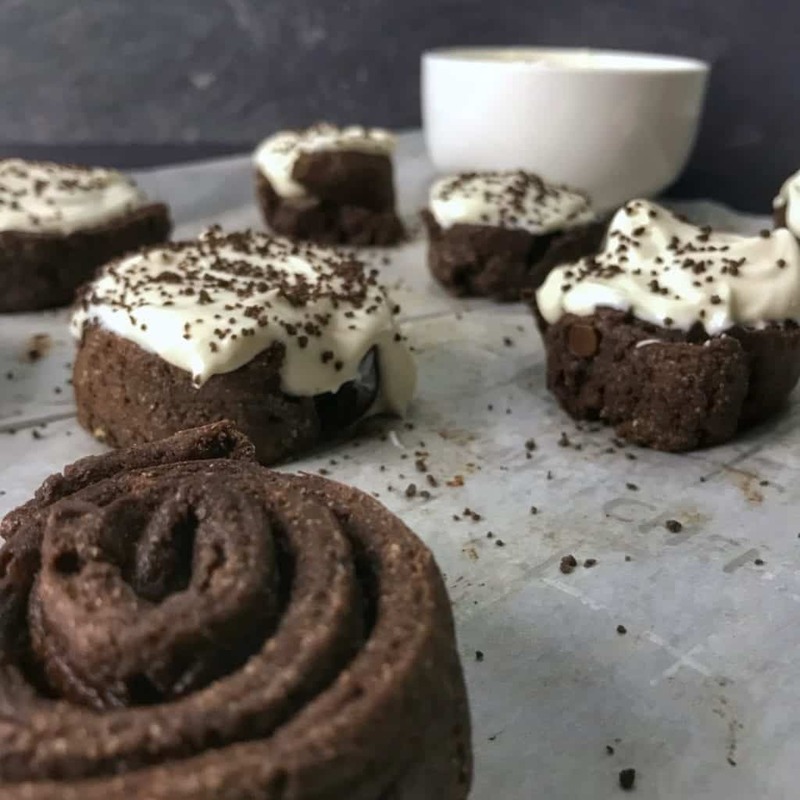 And if you’re looking for a high protein way to start your day, check out my chocolate cinnamon rolls recipe. This recipe was great! Cookies are my favorite sweet and being able to eat these guilt free while fitting my macros is awesome. Thanks mason! Great way to satisfy sweet tooth. I used apple butter instead of pumpkin. They were a bit looser but still great texture. These are great! You can’t paste pumpkin AT ALL but I would mix it in carefully – too much makes them sticky. I have found that 10 cookies is an ideal number – not too big and not too small. These keep well in an airtight container, too. These cookies are amazing!! My husband is addicted to them. By far the best protein cookie I have had. The store bought ones don’t even compare to these. Hi. Can you substitute with oat or almomd flour? Can pb2 powder be substituted for normal pb? Having the worlds biggest sweet tooth + trying to cut weight for a meet = not a fun combination…. but these cookies are a life saver!!!! So so tasty and satisfy all the cravings. These cookies and the almond raspberry mug cake have been my favorite that I’ve tried so far. These are so good! I used bowmar nutrition birthday cake protein powder and it worked great.